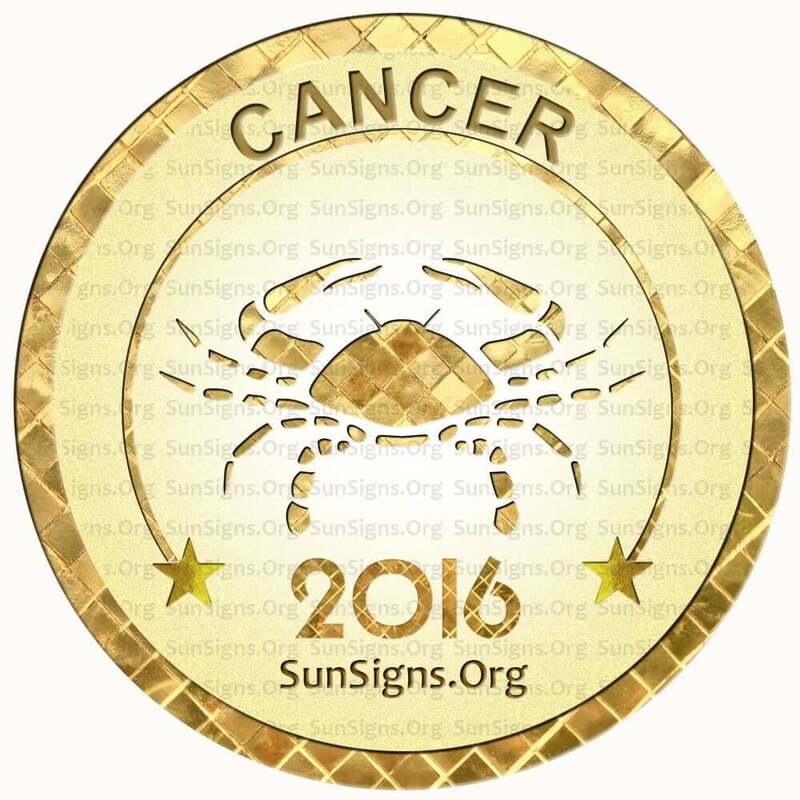 The Cancer Horoscope 2016 foretells that Cancerians will be optimistic and confident during 2016 which will ensure success in their ventures. Any misunderstandings in the family will come to an end with your frank approach. This year you have to be more aggressive while dealing with professional problems and should not hesitate to express your opinion. You will be able to accomplish your targets provided you are realistic in your approach. Mostly your inner voice will guide you properly and you should use your social skills to enlist the support of others. The 2016 love forecasts for Cancer ask you to be cautious while getting into new intimate relationships during the middle of the year. People in serious partnerships will find the going volatile during the year. Between March and June 2016 situation will be pretty bad for love compatibility between couples who are dating. Your behavior with your partner will undergo continuous change. You should resolve your problems with understanding with your love mate for the continuance of the relationship. Pregnancy should be planned after looking at your lunar fertility cycles. The Cancer 2016 astrology forecasts show that till October 2016 you have to depend on collaboration and cooperation from your co-workers in achieving your targets at the work place. Be precise while expressing your requirements from your colleagues. During the last quarter, you will be free to take your decisions and execute your projects. Planetary positions are helpful in accomplishing your professional goals during this period without any hindrance. The Cancer 2016 horoscope foretells that earnings will be good during the beginning of the year 2016 which may result in overspending. You have to limit your expenses to stay within the budget. Businessmen can expand their activities by investing more money in the second quarter of the year. Travel for business purposes will yield good returns from different sources. The Crabs should pay attention to reduce their debts and avoid expenses on unnecessary luxury items. The Cancer horoscope 2016 predicts that health requires proper management during the year. Beginning of the year, you will have plenty of drive to attend to various activities. You have to be careful about your health between March and July 2016, and should relax as much as possible to prevent a break down. Outdoor activities such as sports and leisure travel will enhance the fitness of the Cancer zodiac sign. In 2016, important family issues will need to be sorted out amicably. The 2016 Cancer horoscope predictions forecast that planet Saturn will influence you to review all the aspects of your life this year. You will become aware of your shortcomings in character. This knowledge will guide you to rectify them and improve your character. If you use your originality, you will make excellent progress in life. You will overcome all obstacles if you apply your mind. Your health may be under stress if you do not relax sufficiently in your quest for success. Jupiter will provide necessary energy and chances to improve your life in September and October 2016 of this year. The Cancer zodiac forecasts for 2016 foretell that you will be forced to make drastic changes to your personality and a new individual will appear. It is the right time to remove all hindrances to your progress and formulate new strategies for success. The Cancerians will need to review your relationships and make permanent changes if required. You should try to make essential changes in your outlook and become more independent. Break down all shackles to your thinking and actions. The 2016 horoscope forecasts show that during this year, you have an urge to help others. But you may be helping the wrong type of people. Because of stressful situations that are likely to arise, you feel like avoiding the hard realities and getting out of the situations. If you want peace in life, Cancer, the only solution appears to be to resort to spirituality and seek the help of the Supreme Power. This will help you to change your outlook on life and to change your zodiac personality entirely. Your imaginative faculties will improve. Your self-awareness will change your way of looking at the outer world and other people. 2016 is a year for increased levels of energy and for complete change of personal traits for the Cancer zodiac sign. This will result in a remarkable modification of your old self and will produce a new individual with strong and attractive personality. Your mental strength enhances your emotional power, and both together will produce outstanding results. Your growth will be excellent throughout the year though January and February 2016 will be a warming up period. Do not shun taking more responsibilities, and with your high self-esteem direct the course of life the way you want. Cancerians are affected by the lunar cycles in 2016 and use it to your advantage. Full moons will endow you with more creative energy and this should be used for improving your growth. Your health requires attention and you can improve it by proper diet. January 2016 will be a great time for Cancerians in the professional sphere. Finances might be a little stressed. February 2016 is not a good time to get into new relationships. You will be able to overcome fatigue this month. March 2016 will see a dominant career rather than a happy family life. April 2016 will be a month of salary hikes, job changes promotions and financial bliss, foretells the 2016 horoscope for Cancer. May 2016 will be filled with dynamism, thanks to the presence of planet Mars. Your partner might be a little bit controlling leading to some misunderstandings. June 2016 is a month when the Cancerians should take care of themselves. You can woo your lover with a few romantic gifts. July 2016 is a month of personal pleasures. This can be both sexual or in any other form that appeases you. August 2016 sees you spending both time and money on yourself. It’s a good idea to go on a vacation with your boyfriend this month. September 2016 will be a month to be spent with family, parents, children and friends. Cancer mothers will share excellent relations with their children. October 2016 is a month of social graces. This is a good month to get pregnant. November 2016 will be productive on the job front. Be sure to take care of your liver. December 2016 will be totally devoted to your career. You might need to look at a few alternative therapies for better health. To conclude, the Cancer horoscope 2016 forecasts that this is a good year for development so do not hold yourself back.